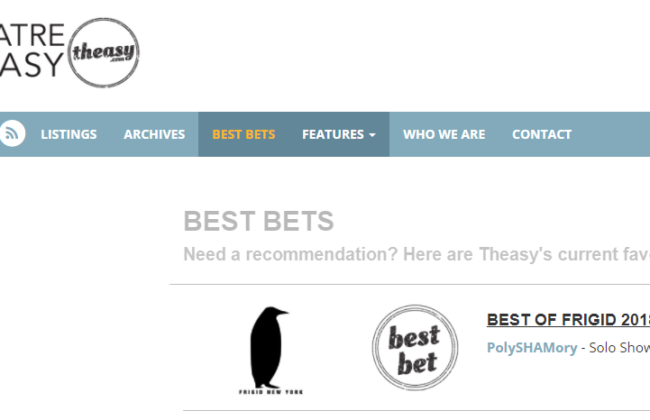 The NYC theatre magazine Theatre is Easy has named PolySHAMory as a “Best Bet” for theatre and “Best of Frigid 2018”. Read Adrienne Urbanski’s review here. You can still catch PolySHAMory at the Kraine Theater (85 East 4th Street, New York, NY) on Wednesday, 2/21 at 10:30 PM, and Fri 3/2 at 5:10 PM. 60 minutes with no intermission. Purchase Tickets.